AFTER watching the-PFeesident's sidekick Victor Matemadanda's soporific homily on one online television, one gets an abiding feeling that indeed Zimbabwe is a God-forsaken country. Besides being the-PFeesident's full-time lapdog, Matemadanda is the deputy minister of Defence and War Veterans who also is moonlighting as "ovets" leader. 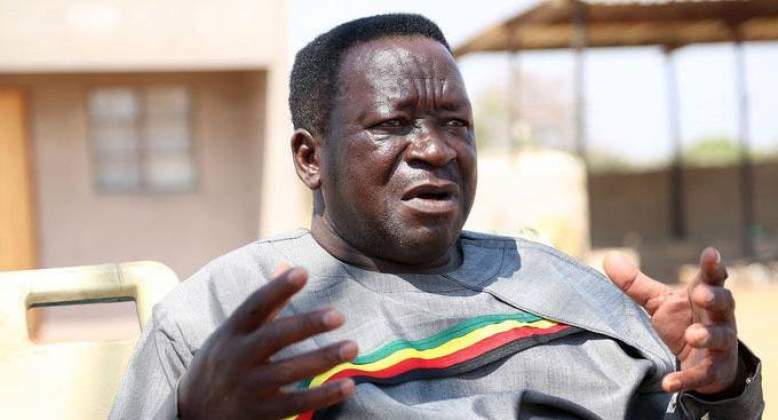 He declared that the old man was a worse killer than Mnangagwa following the latter's birthday message criticising the-PFeesident over the deaths that occurred ever since he assumed the leadership of this country. How so disingenuous! Was the-PFeesident not the minister of State Security at that material time? Why then are his minions trying so hard to exonerate him from Mugabe's egregious errors? As if that is not enough, "ovets" leader held the former head of State solely responsible for the economic hardships facing the country following 37 years of misrule. It really boggles the mind because his current boss was part of the Mugabe regime for years on end since independence and never once did he try to disassociate himself from Mugabe's misrule. If anything, him and his acolytes egged Mugabe on. Phew! Had it not become part of Zany-PF culture to ululate every time Mugabe poured his diatribe to other world leaders at international fora? Is Matemadanda suffering selective amnesia? Matemadanda and his bogus war vets brigade were Mugabe's biggest cheerleaders for years on end. They cheered him on when he set on the path to destruction, they were dead blind to his misdeeds only for their scales to fall when they fell out of favour with him. Ironically, the same individuals want us to accept their-PFeesident, who up until the twilight moments of Mugabe's rule was widely seen as his chief enforcer, lock, stock and barrel! He also says many people have disappeared during Mugabe's era including some who are recent (read: Itai Dzamara). Matemadanda's life did he realise that Mugabe is a killer? Was it before or after he got into the old man's bad graces? However, it was Dexter Nduna's apology that left a sour taste in the mouth. He said: "When you are fighting, there is no formula, you use a hoe, pick and wheelbarrow or anything at your disposal. I want to profusely apologise for my words. "I did not mean anything that I meant. I take back my words. I want to be treated in the same way I am presenting this apology so that the decorum of Parliament can be upheld," he was quoted saying in The Horrid. Is this the abiding philosophy in Zany-PF to use anything at their disposal when fighting? Donald Trump recently renewed targeted sanctions against the Harare regime. As a matter of course, Zany-PF responded with the usual hysterical rhetoric. Zany-PF secretary for information and publicity Simon Khaya Moyo came up with the usual facile statements we have become accustomed to over the years. What is worrying is that the Zany-PF spokesperson seems to be stuck in a time warp. He still prefixes the word sanctions with the term illegal. What is illegal about the sanctions at all? Fadzai Mahere's response could not have been more apposite. She tweeted: "US sanctions against Zimbabwe aren't illegal. They're authorised by their legislature. "They're not forced by any domestic or international law to associate with Zimbabwe beyond what they're comfortable with. "Our opinions on this are irrelevant. If we want them lifted, must play ball. "If they're (Zimbabwe government) serious about wanting the sanctions lifted, they must demonstrate serious commitment to meeting the stated conditions. "The US has no qualms with imposing sanctions for decades (see Cuba). "Unless there's reform, we'll be singing the same tired tune in 20 years' time." It does not look like Zany-PF knows the reason why sanctions were imposed in the first place. If they do, then they are feigning ignorance. Instead of reforming a dead-beat Zany-PF, the regime fritters scarce green backs paying PR companies in the US to lobby for their removal. Is it me alone feeling that we are marching back to our country's dark past besides these empty claims of a new dispensation? Zimbabwe's youngest National Assembly member, Joanna Mamombe and a slew of other MDC MPs are being charged with Mugabe-era trumped up charges of treason. While South Africa's president flew to Zimbabwe to offer moral support to his counterpart, his compatriots and party members back home are fed up with Zimbabweans in that country. One such person is an ANC member and Premier of the Gauteng Province David Makhura who was last week quoted in the Sowetan saying: "I think there is a degree in which we need to have a conversation with our Sadc counterparts. "There are countries that must pay for their citizens to use our health services. Those countries must pay. Some of these countries are just running as if they are not governments. "Think of Lesotho… Swaziland (Eswatini)… Zimbabwe and Mozambique. We've governments there but their citizens get almost everything from South Africa. If someone is ill and arrives at a hospital, which is (an institution) about saving lives, you cannot turn them back and say just because they are Zimbabweans (they shouldn't be treated). "The nature of health institutions and services is to save lives. "We must go to the government of Zimbabwe and say we've treated so many citizens of your country in our facilities because you are not providing (them with these services and you must pay back the money we've spent on treating them). "We must collect this money from these governments."